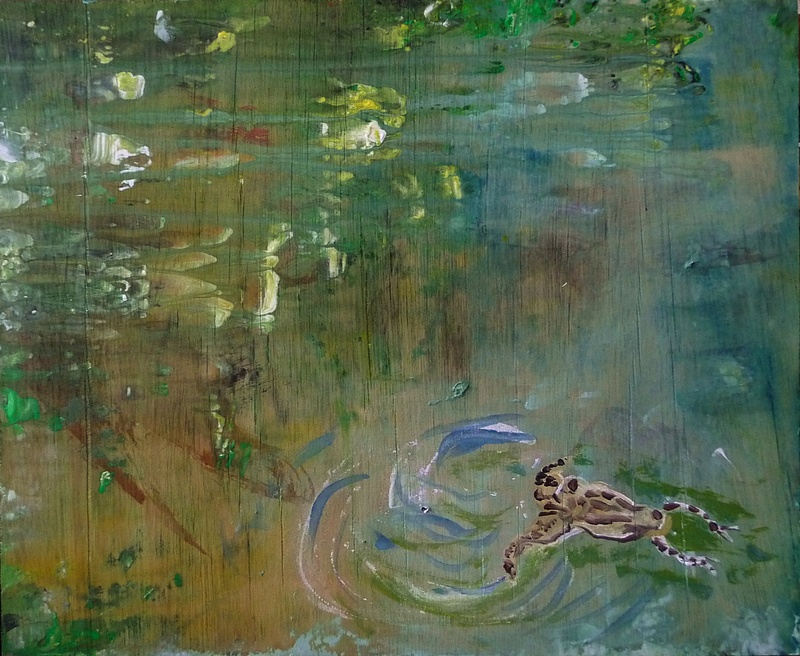 I found time to edit this two-minute video – ‘Frog’ – featuring poetry and cello music by Alan Spence and Atzi Muramatsu, and my painting – ‘Swimming Frog, Hunter’s Bog’ – (more info below vid) .. 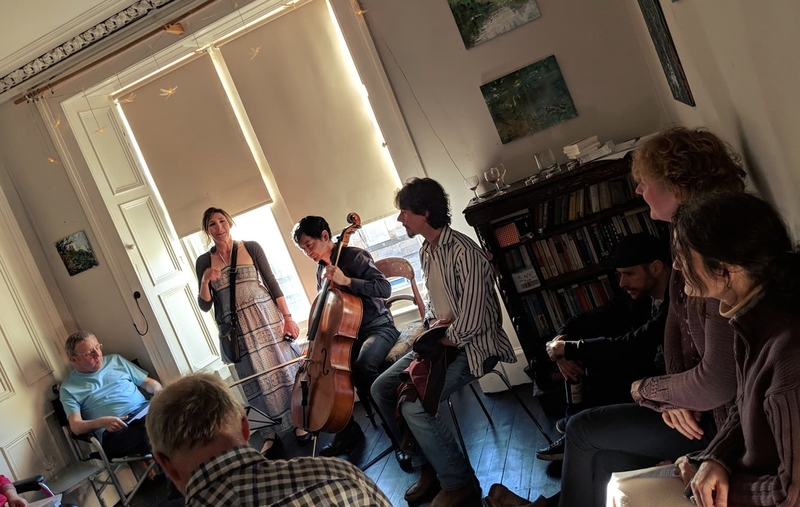 This was part of the launch event of ‘Wells of Arthur’s Seat’, which has been an incredibly rich experience – learning the history of the wells and their significance, collaborating with Alan and Atzi who responded with such artistic sensitivity to the ideas. And of course the idyllic mid-summer’s night music performance on the summer solstice, at St Anthony’s Chapel on Arthur’s Seat, by the talented and wonderful Dominic Harris and Riley Briggs. It’s a great parting note on which to leave Edinburgh for my up-coming painting trip to the Isle of Iona, where I’ll be painting purely en plein air, as they say, for a month, from a tent. The island is meaningful to me as I’ve been going there since I was 20 (back in the far mists of time!) so I’ll post on that soon. Thanks again to everyone involved in this last project, I think it will yield further fruit in future! 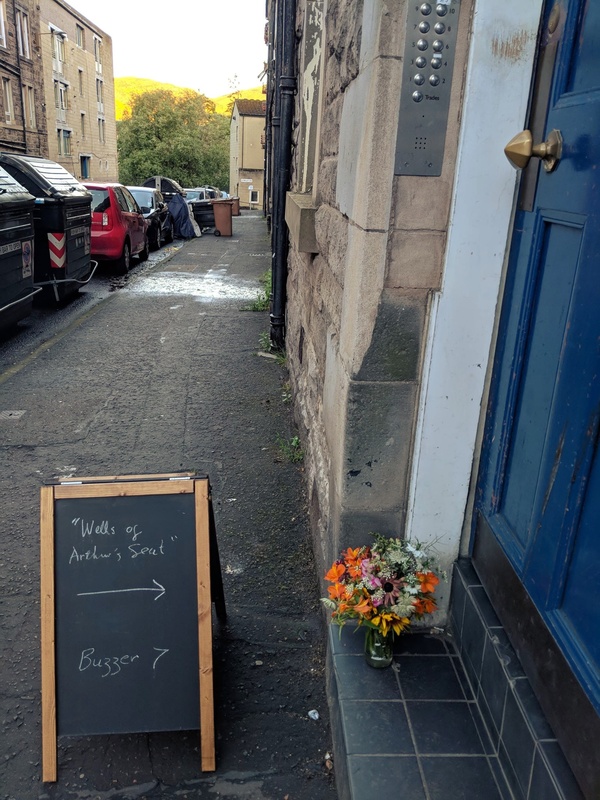 This entry was posted in Uncategorized and tagged Aberfeldy, Alan Spence, Arthur's Seat, atzi muramatsu, cello, Dominic Waxing Lyrical, frog art, frogs, Japanese inspired poetry, live outdoor music, Riley Briggs, rose strang, Scottish artists, St Anthony's Chapel on June 26, 2018 by rosestrang. 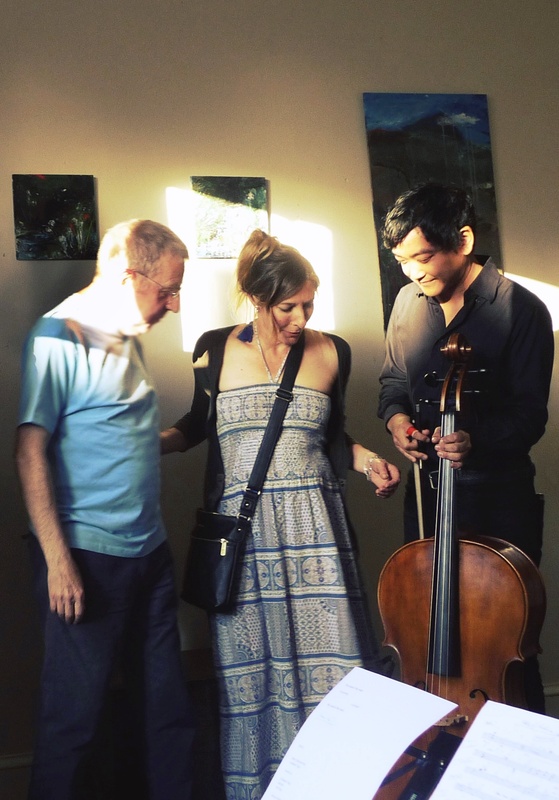 It’s just a week away from my upcoming Hebridean trip and collaboration with author and poet Louise Palfreyman and cellist/composer Atzi Muramatsu. I’ll be travelling with Louise, then post-Hebrides we’ll be collaborating with Atzi (hopefully all of us returning to the Hebrides early next year if funds/time allow). I’ve known Atzi for about 10 years, having met him on various occasions at a variety of venues, concerts and arts events where he performed as a composer and cellist in a variety of genres, from contemporary classical, to performances as part of string quartet Lipsync for a Lullaby and on film scores including The Violinist and The Making of Longbird. I’ve been lucky to work with him on several projects since 2013. Rose: Hi Atzi and thanks for doing this interview. I’ve known you for quite a few years and was always intrigued by your approach as a musician. Your work crosses genres from classical to contemporary but also you work a lot in collaboration with various artists and artforms from dance to film, theatre and art. Can you tell me a bit about your background, where you were born and grew up, why you decided to study music and move to the UK? Atzi: I was born in Japan and grew up there mostly. I tagged along with my father who was transferred to London for his work in 2000. I was simply bored of living in conservative Japan where I felt openness and individuality were not appreciated. I spent a couple of years in London before I came to Scotland to study something unrelated to music. I have always played music, mainly fronting bands. 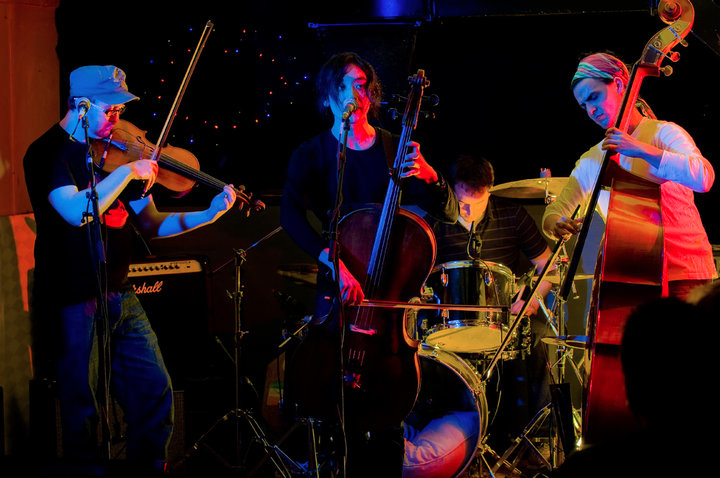 But it was not until a later stage that I picked up a cello and started writing music in broader terms. I was lucky that the music professors and post graduate students at Edinburgh University’s music department saw potential and recommended me to study composition. R: I’ve observed that a strong classical music training can sometimes produce musicians who work only within that tradition; it can be restrictive perhaps to creativity, or appreciation of other genres. Can you talk a bit about the different music forms you work with, and what inspired you to do stray across the usual musical boundaries? A: I’m not a classically trained musician. As most things I do in life I taught myself to play, read and write music. It was a very natural progression as a musician playing in bands getting more interested in contemporary classical music. What many classical musicians suffer is the fear of making the simplest mistake and therefore failing an audition. It’s really a Pavlovian classical conditioning of fear. But I also know a lot of classically trained professional players who are most wonderful improvisers and creative geniuses. 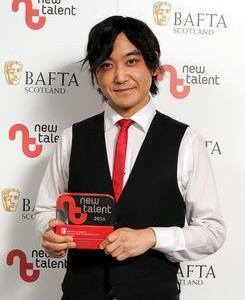 R: Recently you won the Best Composer Award at the BAFTA Scotland New Talent Awards for your work on a short film ‘The Violinist’. I was delighted for you and think it’s very much deserved, because as well as your being talented I know how hard you work. How did it feel to receive the award? Was there a sense of your efforts being recognised at last?! A: Yes most certainly. It’s the accumulation of work you do that leads to things like this. Not just writing for films, but all the playing and collaboration with many artists as that lead to things like an award. Every little thing you’ve done in the past builds your confidence and projection. Having said that, a nomination and a win was a bit of a surprise. I thank the people involved in making the film and putting the £30 entry fee on my behalf. I didn’t even think of submitting the film for the award until prompted. R: How would you describe the collaborative process? What do you enjoy about it or find inspiring? A: It’s that sheer euphoric moment when something sparkles in your brain and all of a sudden everything gets very exciting, new, and challenging. It’s hard to get the same stimulus when you’re working on your own. R: One of your pieces that I first became interested in was ‘Five seconds left’, it spoke to me about the feeling of journeys, though that was my subjective response of course. You generously let me attach it to a video I’d made of slow-motion waves from a ferry (link below). Can you talk about that, the inspiration and why you chose that title? A: The music was an experiment I did long time ago when I was teaching myself some theory. I wrote this piece in 5/8 timing, and the key is constantly shifting so that it makes a full round of circle of fifths. The music is nostalgic, and it seems it goes on repeating forever. But that’s the illusion, thus the title. It does come to an end. R: In 2013 we began to loosely collaborate when you improvised on cello in response to my paintings as part of an exhibition launch. I’m a strong believer in improvisatory and experimental approaches, it keeps the creative process fresh, but it takes someone experienced to make it work as a successful performance or artwork; a final work in itself. I’ve watched you improvise on many occasions and you always appear very comfortable with improvised performance for the public. Can you tell me more about your approach to that? 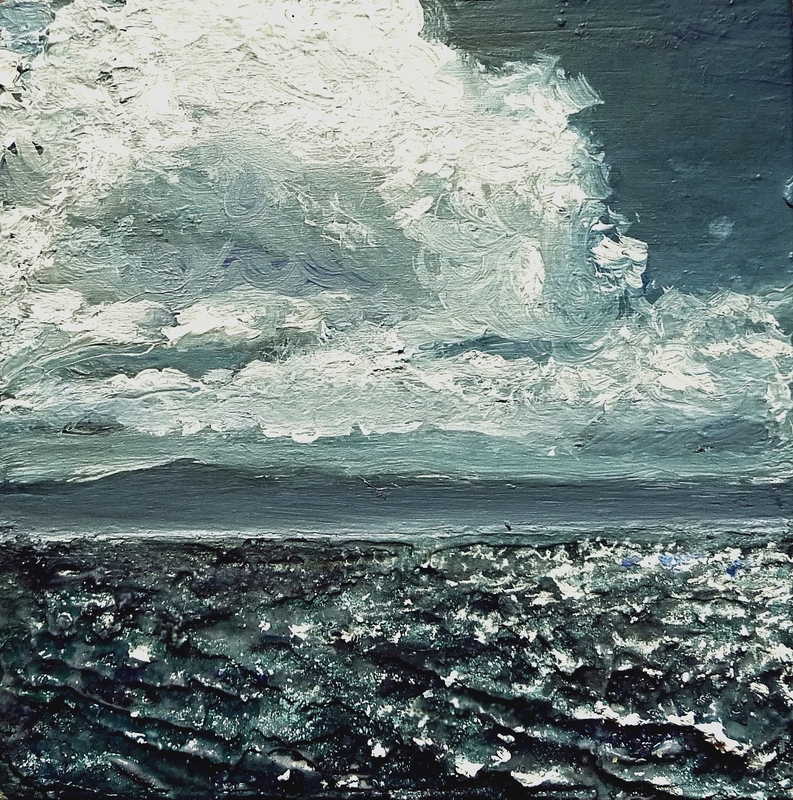 For example, talk me through your improvised response to one of my paintings – ‘Moonlight on Eigg’ (which I recorded on a small camera at the time, link below). I find it an absolutely beautiful piece and was very moved by it. 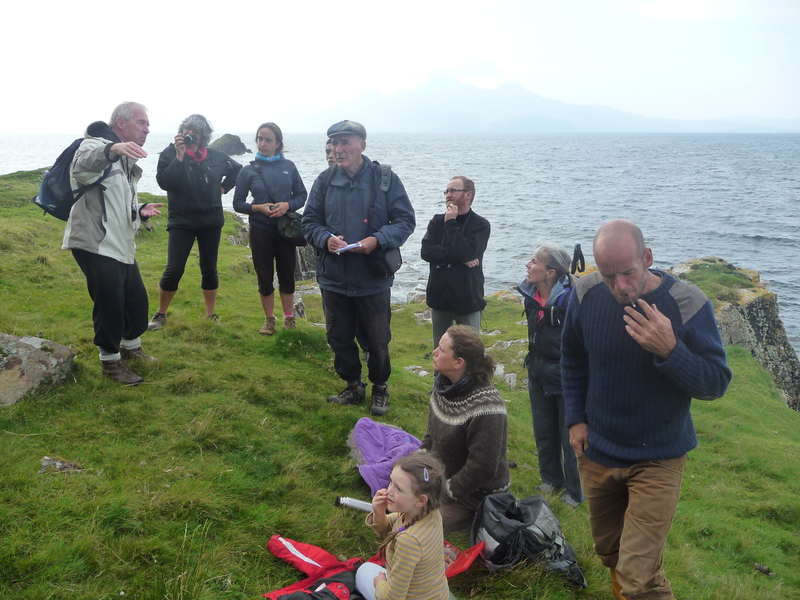 R: In September 2015 we visited the Isle of Eigg as part of a year-long project about Eigg. It was a stroke of luck that our trip coincided with a boat tour of a ship called ‘The Leader’ which was cruising around the inner Hebrides and Eigg, with geologists, writers artists and musicians on board. (The trip re-created the journey made by geologist Hugh Miller who discovered the bones of a Plesiosaurus on the north coast of Eigg in the summer of 1844). I remember we joined in on a day-trip to the cliffs at the north end of the island with geologist Prof’ John Hudson and poet Norman Bisset among others. We stopped at the foot of the cliffs where you began to write your piece for string quartet ‘Gaia Metempsychosis’ (link below, work in progress) Can you talk me through that – what you were thinking or feeling as you sat beneath the cliffs, and the ideas behind the piece? A: Oh yes that was an inspiring trip. I have this fascination with death and decay, like most artists do. It’s a mirror image of life and prosperity. Darker the room, brighter the flame. Anyhow, I saw the ancient rocks finally melting in the sea in front of me. The history died. That was an inspiration. That feeling contrasted being on the island where a lot of people living there are expats who chose a self-sustainable alternative life. So I began writing the sketches of what became the string quartet piece, where there is a lot of death that is also celebratory. I did imagine skeleton bones in an underworld ball room while I sat there. R: On our return to Edinburgh you worked with Jennifer (poet J.L. 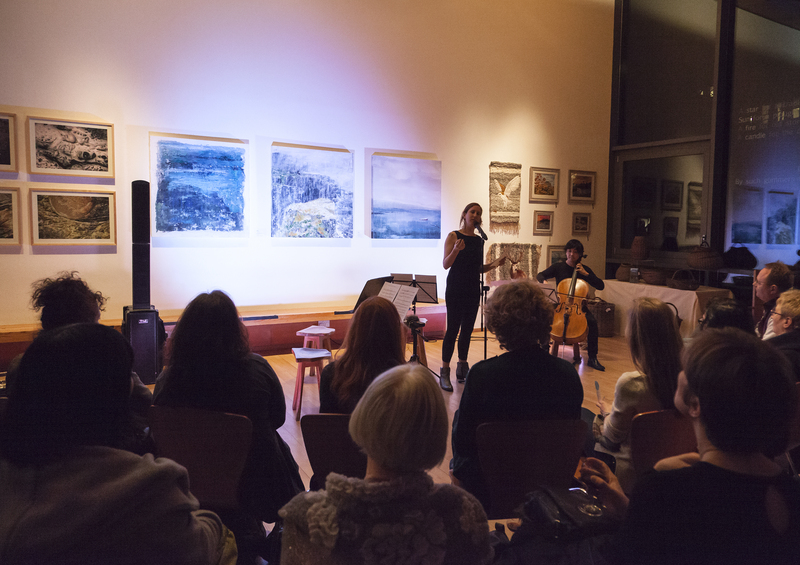 Williams) on a poetry and music collaboration in response to the paintings and themes of the Eigg project, which was performed live at the Scottish Storytelling Centre against the backdrop of my paintings (The ‘Eigg Trilogy’). I named one painting ‘North –Transmigration’ based on the ideas you’d discussed, which echoed what I wanted to capture in the painting – the passing of time, or the way we distill time through art and the creative process. Jennifer’s poem in response was also very moving, and I was struck by the intensity of the combined works. As you know, this collaboration is a real highlight for me, among many years of working in collaboration with artists. 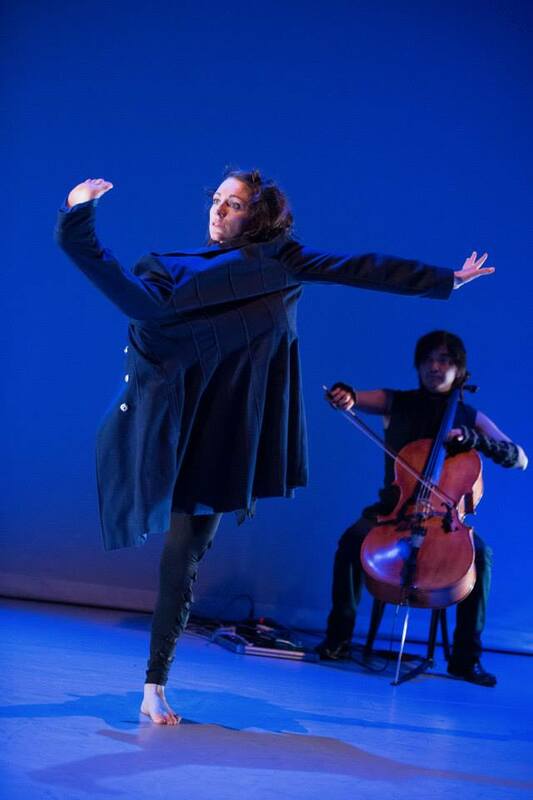 Can you tell me more about how you and Jen worked on that, and the process, particularly for ‘North – Transmigration’? A: We sat and recorded the music and poetry live in her living room. It had to be spontaneous, and I wanted to respond to both the paintings and her readings. There are a lot of elements I picked on from both the reading and the painting; tempo, velocity, volume, brightness, associated memory, etc etc. They all morphed into this one thing which I was, again, a vessel to make them into sound. R: Lastly, I’ve focused mostly here on our collaborations, but would you like to talk about what you’d like to do in future musically? Also, you’ve composed a series of successful pieces for film, can you give an example or two of your favourite film music scores by yourself and by other composers? A: Currently I am working with a real-time music sampling artist Dave House (a.k.a. The Reverse Engineer). We are an experimental electro-pop duo with a gig coming up. We are both enjoying the process very much as we both venture out from our comfort zones. I’m mainly singing and dancing in this. I really like what Jonny Greenwood does in PT Anderson films. He’s a serious scholar in contemporary music but following rather traditional composers like Olivier Messiaen. Often film directors are scared of putting on music that have too much emotional drive to it, so working with a director who understands your artistry is a gift. I’m not sure if I actually like any music that I’ve ever written. I rather have other people be the judge, so that I can free myself from that constraint. I am most self-critical of my work and it’s frankly an annoying trait. R: I think self criticism is true of any artist, I know there’s usually a point when I’m painting where I wail – ‘I can’t paint’! If we’re doing it right it’s probably necessary. There was an interview with David Bowie a few years ago where he laughingly but honestly described the process as quite painful, we get angry and frustrated with ourselves. In your case Atzi, I’d say it’s worth the pain, or at least I know there’s plenty of people who appreciate the results! 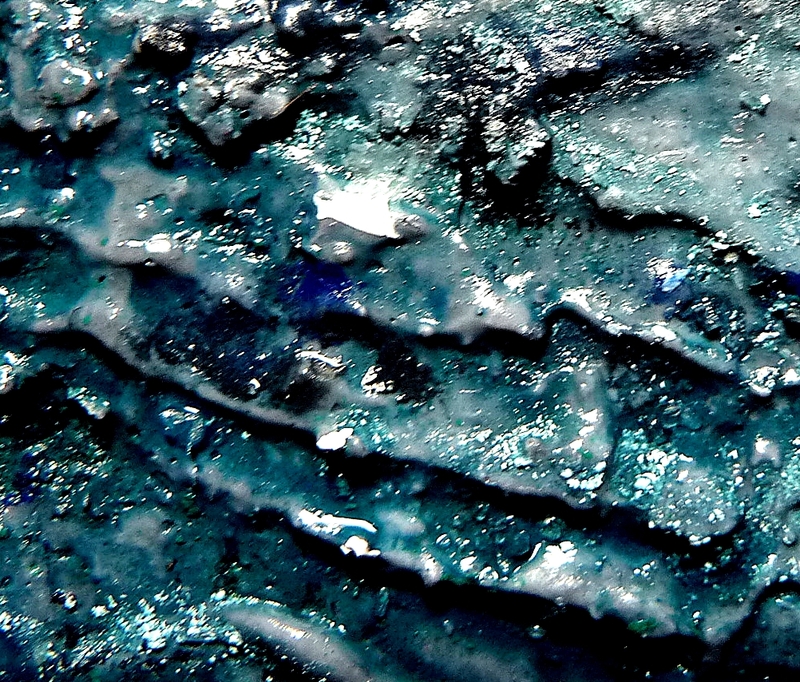 And I’d like to say – that sparkle you talk of (in answers above) when collaborating, is mutual. Thanks for taking time for this Atzi, and I look forward to working with you again later this year. This entry was posted in Uncategorized and tagged atzi muramatsu, Hebrides art, music art collaborations on September 7, 2016 by rosestrang. 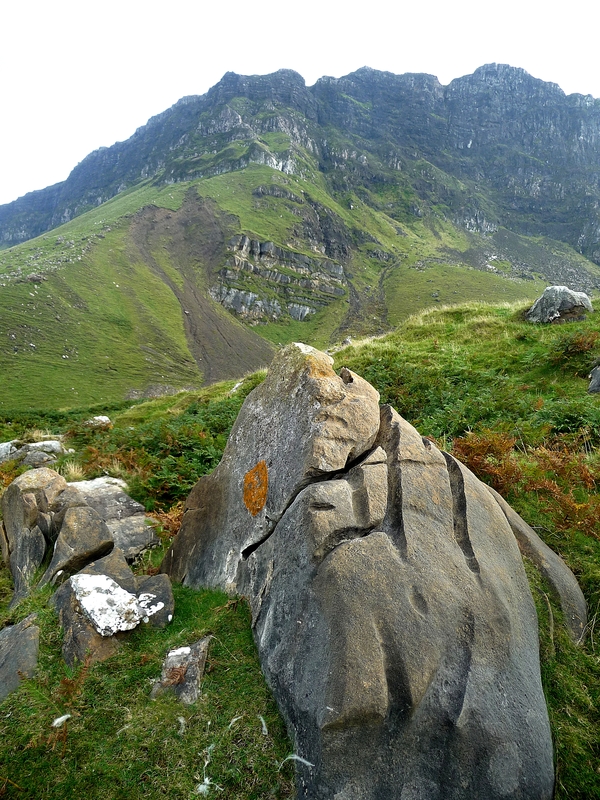 The exhibition of Eigg Island launched at the Scottish Storytelling Centre on Thursday evening last week. It was a great success, with 60 or more people attending and much positive feedback about the performances and artworks. You can view all the artworks Here. I was as always very moved by the poetry and music performances of JL Williams and Atzi Muramatsu. 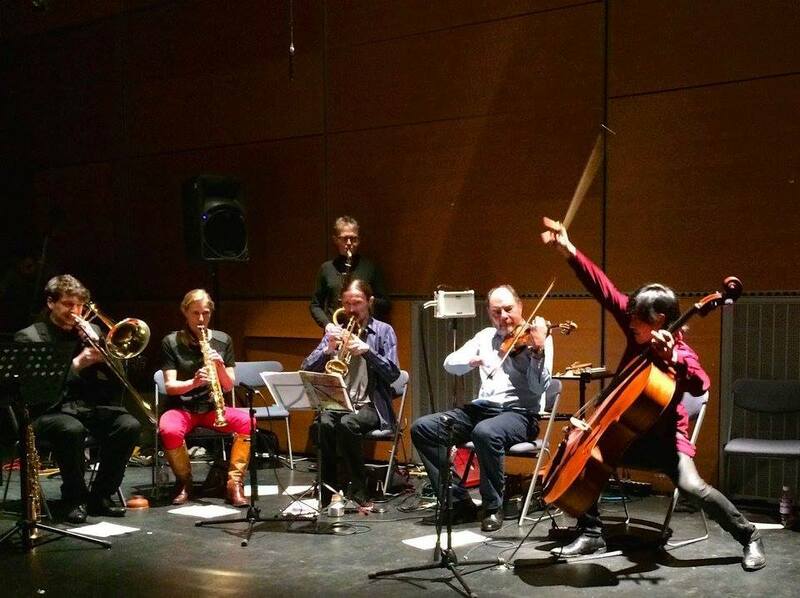 Atzi Muramatsu also performed his piece for string quartet, Gaia Metempsychosis which took its inspiration from the fossil filled cliffs at the North end of Eigg. 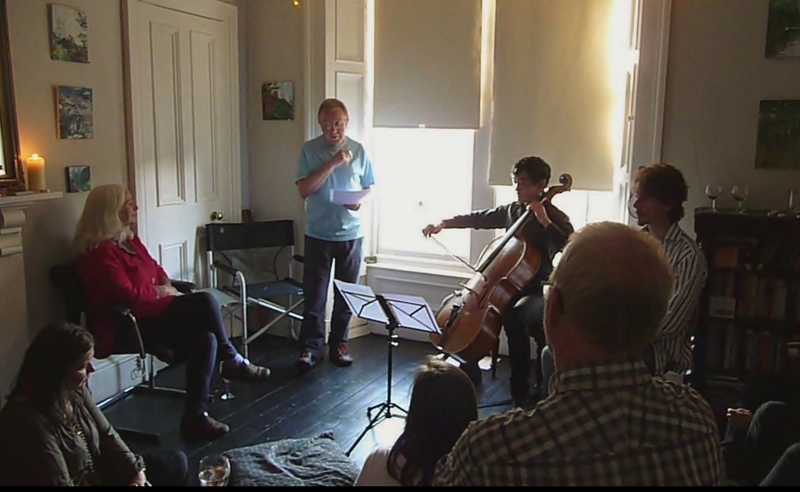 This is a link to the video of the Eigg Island launch event courtesy of Summerhall TV, an arts channel dedicated to promoting the arts in Scotland. Thanks again, to everyone who took part in the launch event! 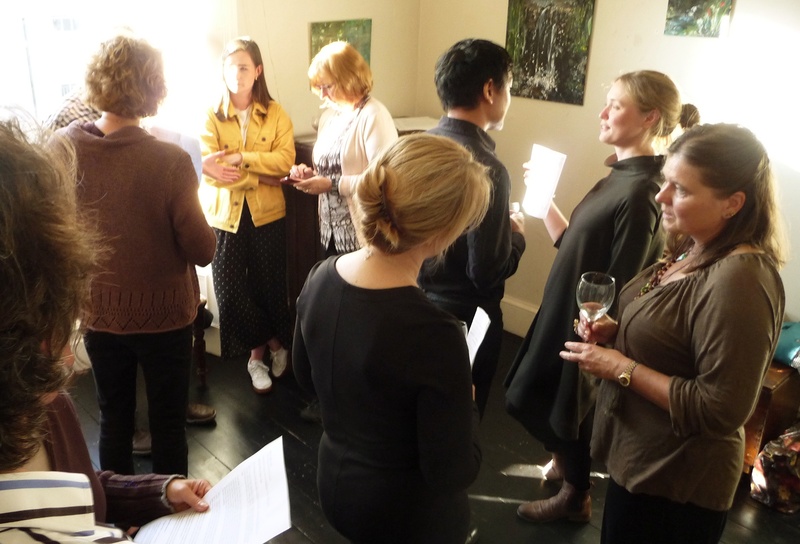 This entry was posted in Uncategorized and tagged atzi muramatsu, Eigg Island event, JL Williams poetry, Lanuch night Eigg Island exhibition, rose strang art on March 31, 2015 by rosestrang. Happy days. I love it when work and ideas merge together into new forms. The above painting is North, second in the series of three paintings for the upcoming Eigg Island exhibition. It was inspired by a day in September on the last visit to Eigg, on the geology trail with geologist Prof’ John Hudson, who showed us fragments of bone from a Pliosaurus (estimated to have lived about 147 million years ago). We sat underneath the fossil-filled cliffs on the north end of the island and ate lunch while Atzi Muramatsu began (unbeknownst to me!) to write a music piece which became ‘Gaea Metempsychosis’; a piece for string quartet, which will be performed at the exhibition launch. It occurred to me after a day of painting the final touches of North that it would make perfect sense to add Atzi (the musician I’m collaborating with alongside poet JL Willams for the exhibition) on the cliff. Once painted I gave him a quick call to make sure he didn’t feel a bit ‘Dorian Gray’ or superstitious about it, but he thought it was a great idea as long as it worked for the painting! ‘Metempsychosis’ is a Greek word meaning transmigration of the soul – or its reincarnation after death, ‘Gaea’ meaning of course – the earth. So the inspiration of fossils, and of being on the island in a particular moment in time, yet feeling the sense of our own infinity – and that, like fossils, we become part of the landscape once more, was the inspiration behind Atzi’s music. North’s place in the trilogy of paintings, is to represent the idea of the reality of being on a Hebridean island, after imagining what that experience will be like, because to me there’s always a time when you feel not a part of the landscape, you’re not sure of your place in this wildness of sea and cliffs, although of course we are a part of it. I have a piece of marble that I collected from the Isle of Iona (the beautiful small island off the coast of Mull on the west coast of Scotland). It represents the idea of ‘Gaea Metempsychosis’ exactly to me. Iona was the first place where, in my early twenties I felt a powerful connection to nature – I felt my place in the cycle of everything. The piece of marble in the photo to the right is formed by the minerals of tiny sea creatures from millions of years ago, their remains crushed by the weight of rocks and ocean over time into dense, heavy white marble. You can see seams of serpentine – a silicate formed by algae and water that ran into cracks and faults of the marble. It’s so beautiful, and it’s from a very rare seam of marble on the south side of the island that’s pretty difficult to find for newcomers. Islanders mined it about 100 years ago to form the alter in Iona Abbey, but to me it’s is best experienced on those south cliffs of Iona, looking out over a wild blue sea. It’s quite difficult to express how rewarding collaboration is; when ideas connect – also the way that nature inspires and makes meaning of our lives. I felt very similarly about the recent Lindisfarne collaboration with poet JL Williams – view video here – When you write to the light.. This entry was posted in Uncategorized and tagged atzi muramatsu, eigg, iona, rose strang art, rose strang painting on March 16, 2015 by rosestrang. With just 16 days to finish four large works I’m slightly fretting! But with painting you can only take each day as it comes. 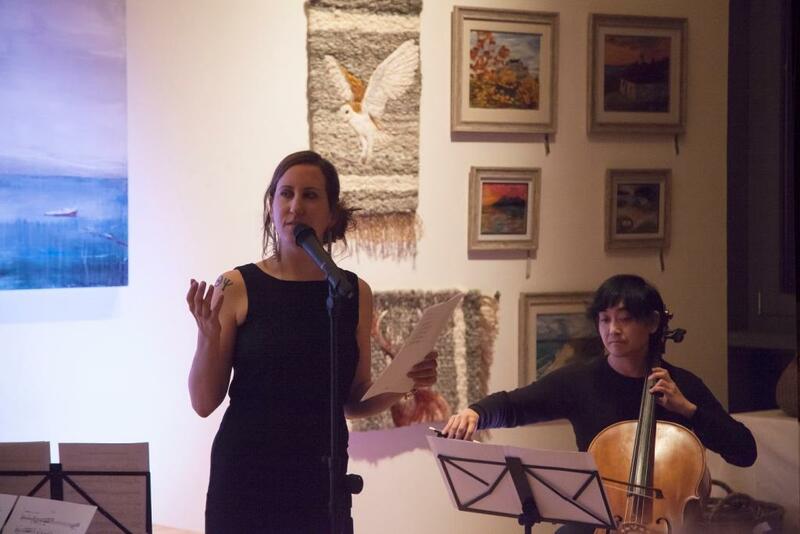 Jennifer is originally from New Jersey, she’s currently Programme Manager for the Scottish Poetry Library but for many years has been a writer, talented poet, and a performer with beautifully atmospheric vocal expression. 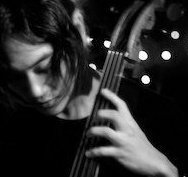 Atzi Muramatsu, originally from Japan, is a talented cellist/composer who also wrote the filmscore for BAFTA award-winning film ‘The Making of Longbird’. For the Whitespace preview, Atzi will be improvising music in response to my paintings – he improvised at last year’s exhibition, and it was such an imaginative way of perceiving the paintings – which also focused viewers amongst the busyness of a social occasion. It’s just great that Jennifer and Atzi will be performing at the private view, it makes this into a really special event! 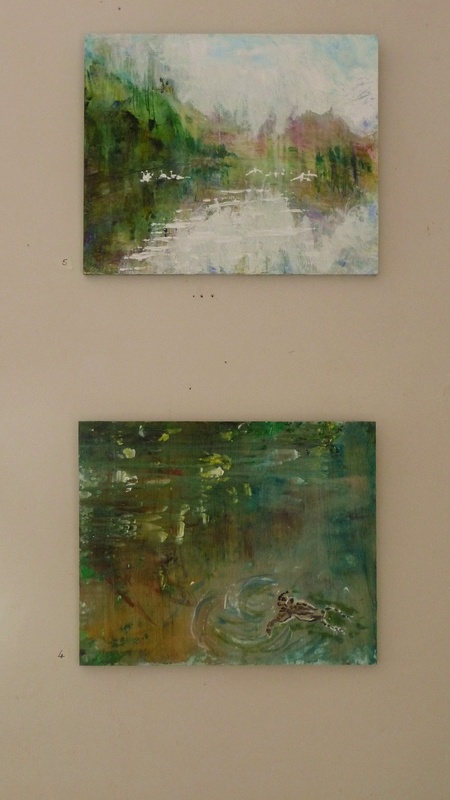 This entry was posted in Uncategorized and tagged atzi muramatsu, jennifer l williams, rose strang artworks, rose strang exhibitions, rose strang paintings on July 2, 2014 by rosestrang. Sanskrit philosophers wrote about presence thousands of years ago, but I like the immediacy of Alan Ball’s take on it – a plastic bag in the wind, which brings us into the here and now, and our anxiety producing world of rapid change and competition. Below is a short video I took of waves from the Mallaig-Eigg ferry, accompanied by music from my friend Atzi Muramatsu, who moved from Japan to the UK some years ago. When I first heard this piece I was reminded of the rhythm of boats, waves, and the anticipation of journeys. 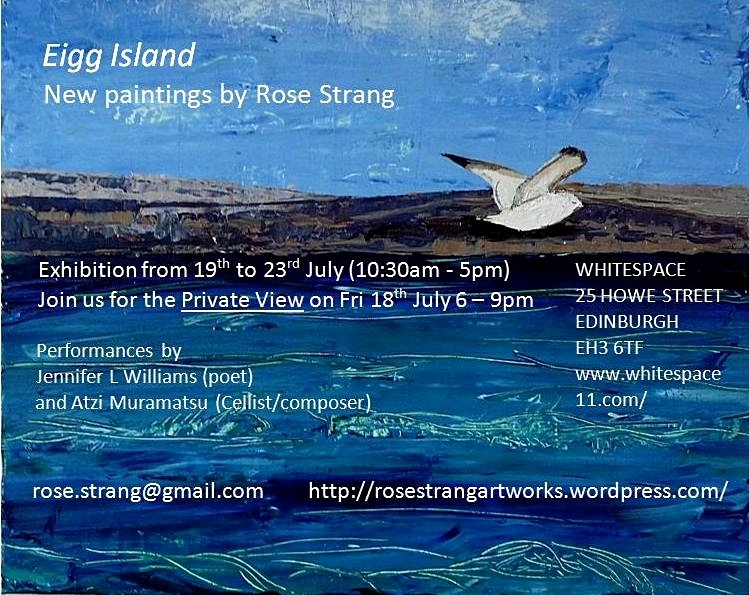 This entry was posted in Uncategorized and tagged art and eigg, atzi muramatsu, eigg paintings, isle of eigg, rose strang art, waves on April 12, 2014 by rosestrang.